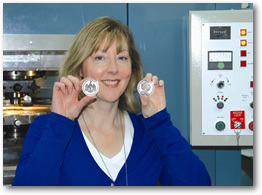 Ms Joanne Yeadon, Administrator of British Indian Ocean Territory recently visited the Pobjoy Mint to strike the first coin of the Territory. This legal tender commemorative coin feature in highest quality relief the Coat of Arms of the Territory which was formally granted in 1990 on the 25th Anniversary of the Territory’s establishment. The Arms consist of a shield bearing the Union Flag in the top quarter, a palm tree and St. Edward’s Crown in the middle half, with three white wavy lines representing the ocean in the bottom quarter. The two supporters are Turtles (Green and Hawksbill) representing the local native wildlife. The crest consists of a Crown and Castle bearing the Territory’s flag. The motto in Latin is "In Tutela Nostra Limuria", in English this translates "Limuria is in our Trust" and refers to the non-existent continent of Limuria, once thought to occupy the Indian Ocean. This is the last of the Overseas Territories to issue coins and Pobjoy Mint is delighted to have been entrusted with the responsibility of assisting the Territory to release commemorative coinage. The obverse of the coin carries a fine effigy of Her Majesty Queen Elizabeth II by Ian Rank-Broadley FRIBS FSNAD, as does the second coin which shows in spectacular form the Life Cycle of the Turtle with Blue Crystal surrounded by Sterling Silver. Pobjoy Mint is delighted to introduce the first ever commemorative coin to be approved for issue by the Administration of the British Indian Ocean Territory. The Chagos islands were first discovered by Portuguese mariners in the early 16th century. The French assumed sovereignty more than two centuries later and began to exploit the hitherto uninhabited islands for copra in the 1780s. The islands became British when ceded by France to Britain, together with Mauritius and Seychelles, in 1814. Following the French practice, they continued to be administered from Mauritius. During French rule and for a short period thereafter, the copra plantation labour was slave labour. But when slavery was abolished in all British possessions in the 1830s, the British authorities introduced a temporary system of labour apprenticeship in the Chagos islands. After this, the plantation workforce became contract labourers and this continued to be the basis of employment so long as the copra plantations remained in operation. Prior to Mauritius achieving independence and with the agreement of the Mauritius Council of Ministers, the islands were detached in 1965 to form part of the British Indian Ocean Territory (BIOT), together with some other small island groups that were detached from (but later reverted to) Seychelles. The Territory was created to provide for the defence needs of both the United States and Britain. Her Majesty’s Government subsequently gave Mauritius an undertaking to cede the islands to Mauritius when they were no longer required for defence needs. However, since the 1980s, successive Mauritius governments have asserted a sovereignty claim to the islands, arguing that they were detached illegally. Her Majesty’s Government has entered into a series of bilateral agreements with the United States to regulate the use of the islands. The first of these agreements, to which the later ones are essentially supplementary, was the 1966 agreement which provides that the Territory is to remain available for the defence needs of the two countries for an initial period of 50 years. Later agreements deal with particular aspects of this arrangement, including the establishment and functioning of a US defence facility on the principal island, Diego Garcia. 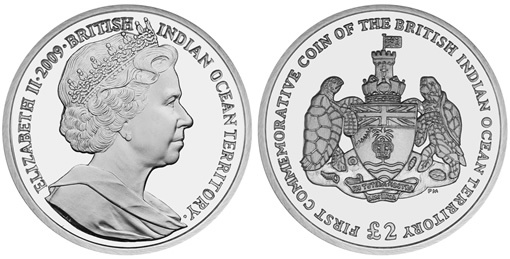 This first coin issued under the British Indian Ocean Territory Coin Ordinance 2008 depicts the Coat of Arms of the Territory which was formally granted in 1990 on the 25th Anniversary of the Territory’s Establishment. The arms consist of a shield bearing the Union Flag in the top quarter, a palm tree and St. Edward’s Crown in the middle half, with three white wavy lines representing the ocean in the bottom quarter. The two supporters are turtles (Green and Hawksbill), representing the local native wildlife. The crest consists of a crown and a castle bearing the territory’s flag. The motto, in Latin is ‘In Tutela Nostra Limuria’. In English, Limuria is in our trust. This refers to the non-existent continent of Limuria, once thought to occupy the Indian Ocean. A coin that commemorates itself. How delightfully recursive. You can say that again, Cal.